← Cute, Pink and Shiny! When aluminum foil goes cute. Brothers Burgers One Day Half Pounder Sale is here again! What do you get when you take half off a half-pounder? A quarter sounds logical but instead, you get Brothers Burger’s One Day Half Pounder Sale! It’s their anniversary tomorrow, September 26 so to celebrate, selected branches will be taking 50% off the price of their half-pounder Big Brother’s Burger. Photo above taken from Brothers Burgers website. Used for review purposes only. Likewise, burger above is the one pound burger which is not the one that’s on sale. This entry was posted in culinary events, restos & eateries. Bookmark the permalink. 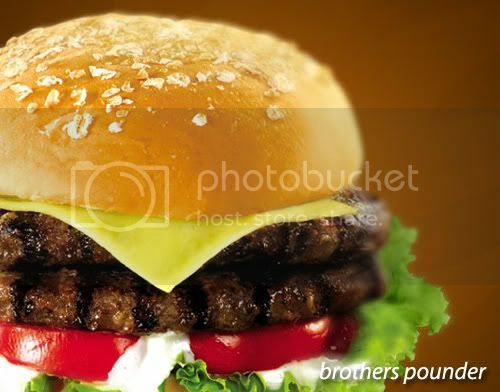 4 Responses to Brothers Burgers One Day Half Pounder Sale is here again! Waaaah! I wanna cry! My officemates were disagreeing on where to eat brunch yesterday, and Brothers came up, but nobody seconded the motion… We missed this, big time! CILANTRO CREAM. Yes yes yes! That wasn’t the one I had but yes. They’re soooo yummy. I don’t want to even think about it right now because I might end up dragging myself there for dinner! Sayang! 50% off is so sulit. Do you have any idea how they make that super yummy Cilantro cream? I’d love to make some of my own.